The Iron Gods Adventure path begins with "Fires of Creation", an exciting new adventure set in Numereria, land of barbarians and super-science!. In the town of Torch, the settlement's un-ignorable tower of violet flame has gone out. The only clue to its disappearance is a newly discovered cave dug nearby. Are the heroes bold enough to unearth the otherworldly secrets beneath the city and reignite the fires of Torch? Or will their first foray into Numeria's ancient mysteries be their last? 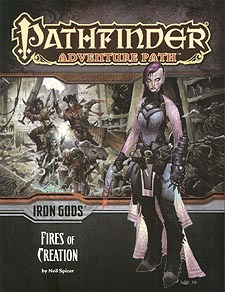 "Fires of Creation" a Pathfinder adventure for 1st-level characters by Neil Spicer. A host of new monsters by Neil Spicer, Mark Garringer, and Mike Welham.